Karl Lagerfeld was a very high-end, well respected fashion designer. It is suspected that Lagerfeld was born on the date September 10, 1938 in Hamburg, Germany. He never made his birthday public knowledge, but this is what people speculate. From a young age, he was interested in fashion and all things glamorous. As quoted in a recent article published by Vogue, Lagerfeld said, “When I was four, I asked my mom for a valet for my birthday.” At the young age of 14, he moved to Paris to enter a fashion competition. He submitted a few designs and sketches and ended up winning first place. “Once upon a time Chanel was old hat. It was only Parisian doctors’ wives who still wore it. Nobody wanted it, it was hopeless,” Lagerfeld said soon after he showed his first collection for the fashion house in January 1983. He was introduced to Chanel in the fall of 1983. When he first joined, he wasn’t welcomed with open arms. His first collection at Chanel was inspired by the 1920s and 1930s. A lot of people were upset with his choices saying he “committed too many Chanel Dont’s and not enough Do’s.” Eventually becoming head designer, he reinvented the brand into a multi-billion dollar enterprise. He revamped the brand’s accessory lines, making it more desirable to younger buyers. Throughout his life, he built relationships and friendships with dozens of celebrities, such as Cara Delevingne, Sarah Jessica Parker, Ralph Lauren, Giorgio Armani, and many other performers, models and designers. On February 19, Karl Lagerfeld passed away at the age of 85. Many of his celebrity friends spoke out on behalf of him and what he did to improve and redefine the fashion industry. Karl Lagerfeld was one of the most influential, time-changing, creative people in the fashion industry. He was loved and adored by thousands of fans and celebrities. 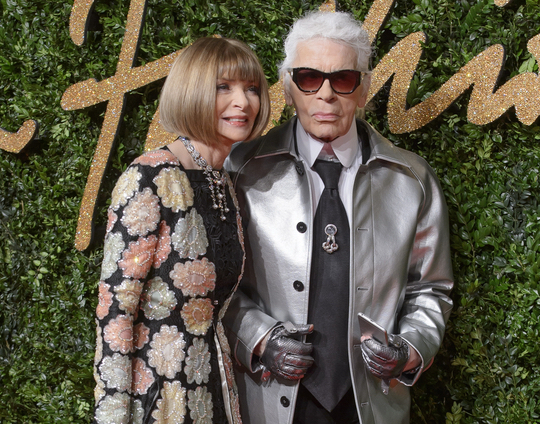 Nearly one month later and the world is still mourning the loss of Lagerfeld.